In this recipe, fagioli al fiasco, the beans are traditionally packed into an earthenware flask that is then left to simmer, very slowly, in a fire's embers or in a bread oven. Serve it with a little extra olive oil over each portion. 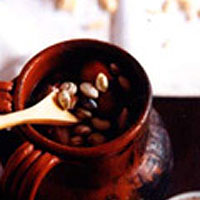 Soak the beans in plenty of cold water for at least 12 hours. Preheat the oven to 140C/ gas 1. Drain the beans and rinse thoroughly in cold water. Put them in a 2-litre, heavy-based casserole with 800ml water; set over a low heat. Bring to the boil very slowly (this will take about 30 minutes). Skim off any surface foam, then add the salt, olive oil, onion, garlic, sage and tomato. Cover with a circle of baking parchment under the lid, to stop any liquid escaping. Bake for 2 hours 30 minutes, until the beans are tender. If they look dry, top up with a little water. Remove the lid and place the casserole over a medium heat. Remove the sage sprig. Season the soup to taste, add the pasta and stir. Simmer gently for about 7 minutes, or until the pasta is just cooked.